Barack Obama has taken a tour of the Bob Marley museum in Jamaica after becoming the first US president to visit the country since 1982. To the strains of the late reggae star’s One Love, Mr Obama was shown around the sprawling house in Kingston that was Mr Marley’s final home. Mr Obama is in Jamaica to meet the 15-member Caribbean Community bloc. But his first stop after landing in Kingston was the old Victorian-style house in central Kingston that Mr Marley called home between 1975 and his death in 1981. 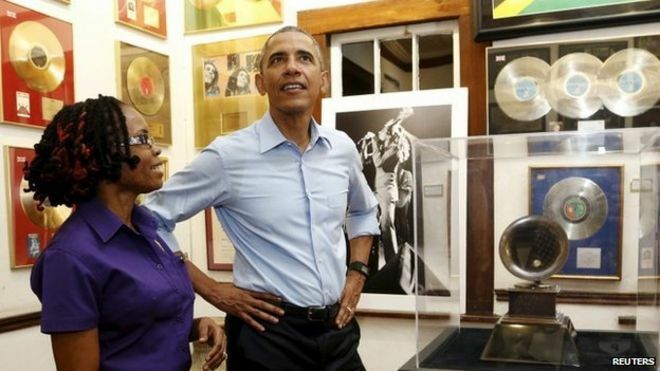 Mr Obama spent 20 minutes in the museum, which now houses artefacts from the singer’s life including gold records and his Grammy Lifetime Achievement award. His arrival aboard Air Force One on Wednesday made him the first sitting US president to set foot in the country since Ronald Reagan visited 33 years ago. He was greeted by Jamaican Prime Minister Portia Simpson-Miller and the US Ambassador to Jamaica, Luis Moreno. Mr Obama will meet representatives of the 15 countries in the Caribbean Community group on the three-day trip to Jamaica and Panama, and is expected to discuss energy and security issues. Reblogged via Obama in Jamaica pays tribute to Bob Marley – BBC News.